You can choose any single level to protect your home or combine the different levels depending on the level of risk. Here’ a quick explanation . If you hate reading or need more help, speak to one of our home security experts. We’ll give you in depth- expert on advice on your situation with absolutely no obligation. We’d love to help. This is the starting point for any home alarm system . Depending on your requirements it might be all you need. It involves the strategic placement of infra-red motion sensors in your home. When installed correctly, an intruder can be detected after taking no more than 3-5 steps in your home, no matter what entry point he used. Most homes can be adequately protected with 3 or 4 infra red sensors. Our alarm panels can handle at least 16 sensors so there’s plenty of room for expansion if you need to add more in the future. Infra red sensors also come in a pet-tolerant version. These smart sensors allow you to turn the alarm system on while your pets are still inside. Once they are correctly set-up and tested they will provide years of reliable trouble-free protection. Interior alarm systems are really designed to protect you’re home from intruders while you’re out. However all our alarm systems feature a ‘Stay’ mode. This offers you a degree of protection while you sleep – the bedroom sensors are switched off while the living areas and garage remain armed, ready to detect any movement in your home. Two powerful super-loud internal ‘screamer’ sirens are activated. Their purpose is to startle the intruder and let him know that he has been detected. Due to their high volume,they also disable his ability to hear you or the police or a neighbor entering your home to investigate. It’s important to understand that the intruder is after money or small items that he can sell quickly for cash. He knows he’ll only make a few hundred dollars from any home break-in. It’s not worth him getting caught. Chances are if he triggers these sirens he will turn and run. There are so many homes in your street or suburb that don’t have an alarm or any deterrents. I’ve written an e-book that you can download here for free that shows you how you can make your home the safest house in the street yourself without spending a fortune. The external siren and blue strobe light will activate. This alerts neighbors and passes-by that something is going on at your home. I don’t expect that a neighbor is likely to charge through your front door and tackle an intruder (but it has happened!). However someone may see the intruder as he leaves and be able to give some useful information to the police. These sirens – internal and external – will operate for 2 minutes and then stop. They will not activate again unless the intruder is still inside (unlikely) and triggers another motion detector. The blue strobe light will continue to flash until you get home and disarm the alarm. It’s job is to warn you that the alarm system has been triggered while you were out. If this is the case it’s advisable to have a look around your home from the outside or better yet get a friend or neighbor to have a look with you before you go inside. Someone is notified. The ‘someone’ depends on the option you’ve chosen when we installed your alarm. (a) A professional monitoring control room. They charge a monthly fee and let you know if the alarm has been triggered. I don’t recommend this option for most homeowners. (b) A basic phone alert sent to up to 3 mobile phones, or….. The last thing you want is to be woken up by an intruder that’s broken in to your home! We recommend the use of shock sensors and door and widow sensors (called ‘reed switches’) to monitor all accessible openings and alert you (and the intruder) if a breech has occurred.These can simply be added to any of our home security system packages. The reed switches are a two-part sensor. One part( the reed switch) is mounted on the door or window frame. The other part (the magnet) is mounted on the door or window. The two parts should line up when the door or window is closed. When the two parts are separated (by opening the door or window) the alarm is triggered. The shock sensors are attached to the window or door frame or directly on the glass. They respond to the vibrations caused by a brute-force attack, such as smashing a window or kicking the middle out of a door. A reed switch wont respond to this sort of attack. Nor will a shock sensor respond to a window or door being opened. By using both types of sensors you stand an excellent chance of detecting an intruder before he even gets inside your home. Standard perimeter protection is useful for detecting a break in at the other end of the house while you’re sleeping, if your bedroom is along way from your children’s bedrooms for example. Or for two storey homes where all the bedrooms are upstairs, the downstairs windows and doors can be monitored while you sleep. This video shows Tara breaking into a window at my house using a $20.00 cordless drill from Bunnings. It takes her less than 10 seconds! When installed correctly they won’t be triggered by dogs, cats possums or leaves. If an intruder is detected, a low but persistent siren tone is triggered on the receiver unit. The receiver has a volume control and can be moved from room to room. This gives you a chance to get up and investigate well before the intruder has even decided which door or window to break in to. It’s well known by experienced police and security experts that if you can disrupt an intruder before he’s broken in, you have an excellent chance of preventing the crime occurring. The system can also be set up to sound a loud siren if you don’t (or can’t) acknowledge the low-level alert after 15 or 20 seconds.With the help of an electrician, the Early Warning Perimeter alarm can also switch on powerful floodlights, another excellent deterrent to crime. Or how about a high definition camera that sends you a 30 second high quality video clip on the intruder – even in complete darkness.. It’s all possible and affordable. Up to 16 infra-red trip wires can work with a single receiver unit – you can build a safe perimeter all around your home.You can also have an unlimited number of receiver units. As well as the low-level alert you can also receive a notification directly on your smartphone via an app. The trip-wires can be turned off when not needed, or set up to automatically turned on and off at times pre-determined by you. We’ve also used these to alert customers with long driveways or on acreage properties of the arrival of visitors. No more surprise guests appearing at the front door! 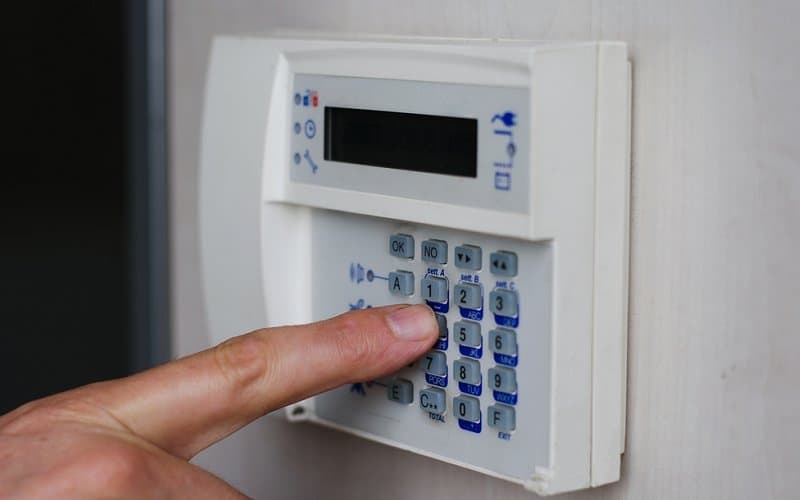 The best home security system is the one that you can comfortably afford and that makes you feel safe.There is a never ending number of security measures you can take but if you do the very basics you’ll find you will deter an intruder from even choosing your home as a target. Lock your doors and windows when you leave. Questions? Want to know more?. Speak to one of our security experts now 9005 0174. Or fill out the form at the top of the page and we’ll call you.